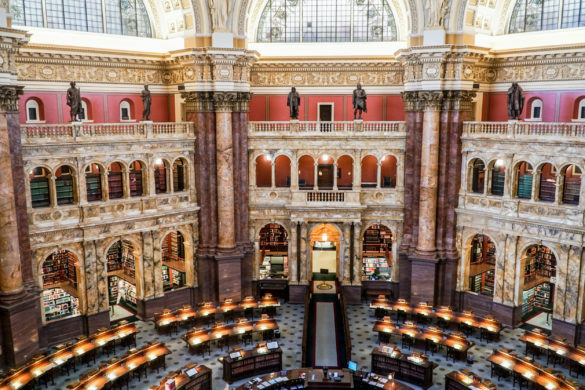 Did you know that half of the 12 top-rated architectural wonders of the US can be found in one small area of the country? And the area can be covered on foot. This amazing concentration of fascinating and varied memorials is found in the center of Washington, DC. 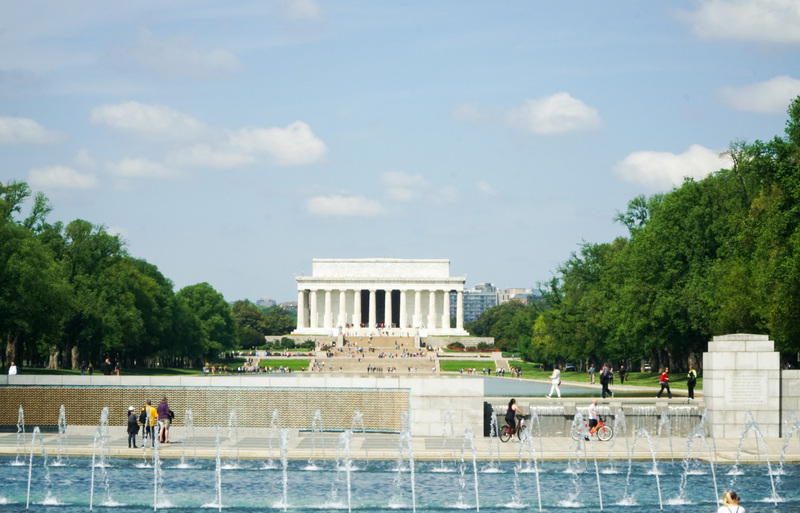 Run by the National Parks system, it is known officially as the Washington Mall and Memorial Parks. 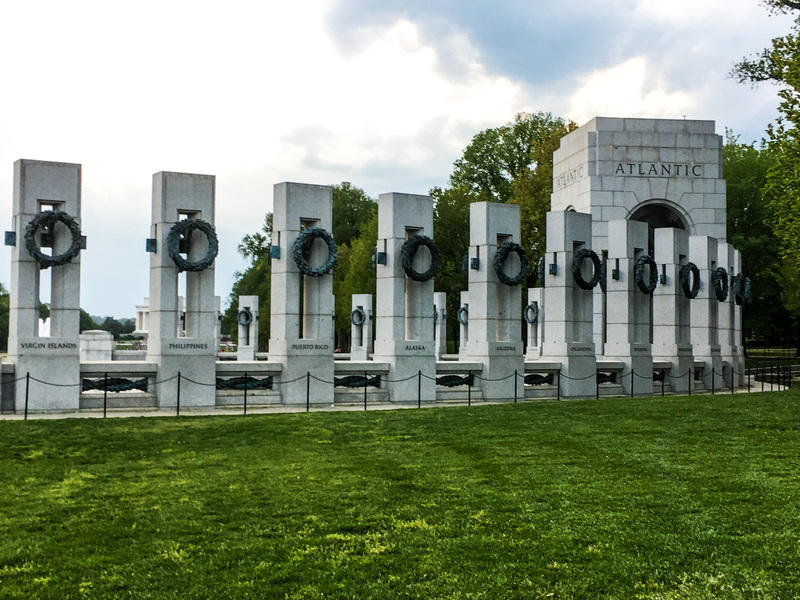 Here are the impressive memorials I was able to visit on our recent trip. Notice in the photos that often more than one of these is within view. You are surrounded by historical meaning and elegance. 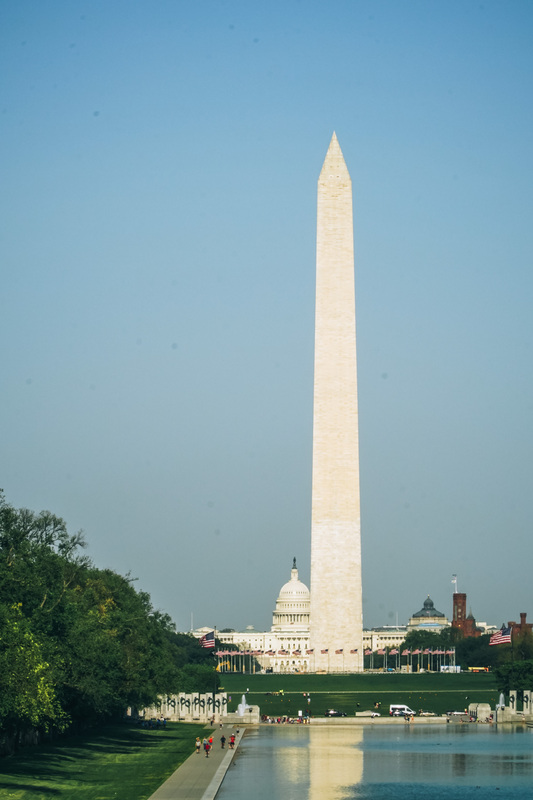 The obelisk seen from near and far is the tallest freestanding stone structure in the world, built to honor the country’s first president, George Washington. 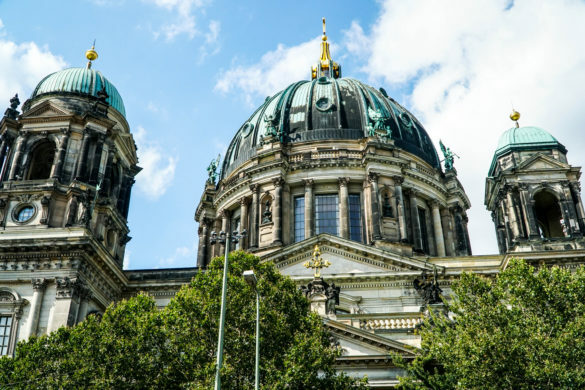 Construction began in 1848 but was interrupted due to war and political arguments. Look closely and you can see that a clear line where the color of the stone changes partway up. This marks the place where the first installment stalled and to continue, builders brought in stone from a different quarry. 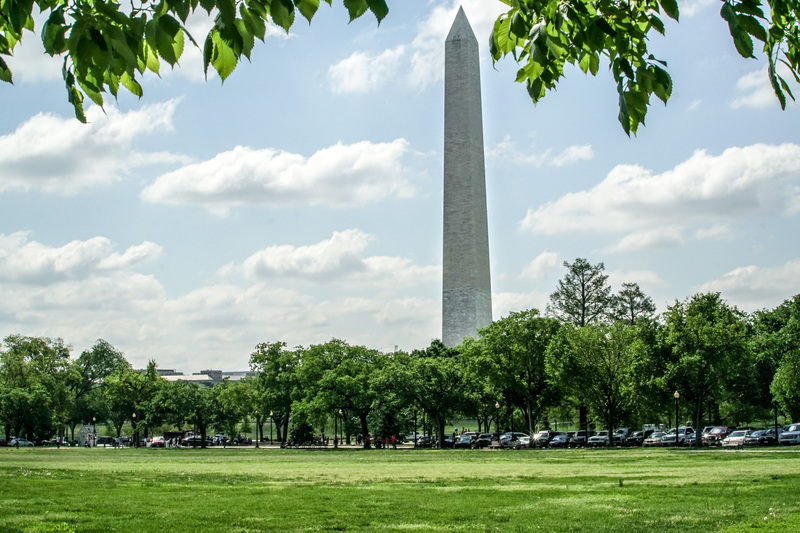 Wherever you are on the mall, you can see the Washington Monument soaring above the skyline. 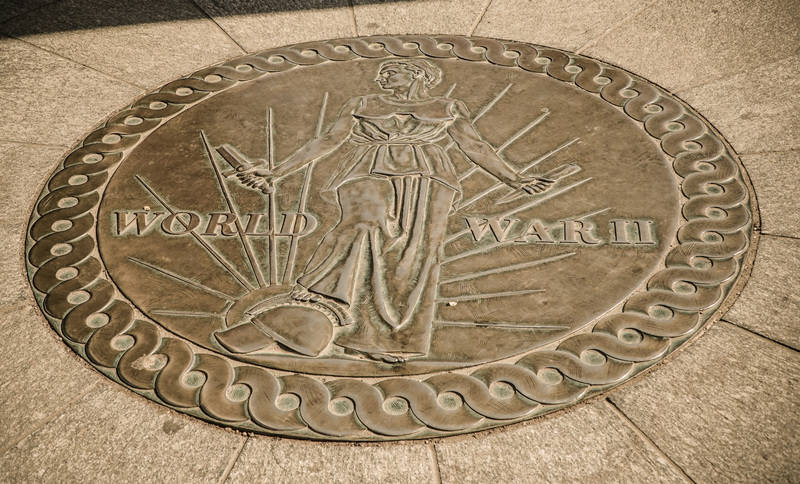 Right next to the Washington Monument is the appealing World War II Memorial. 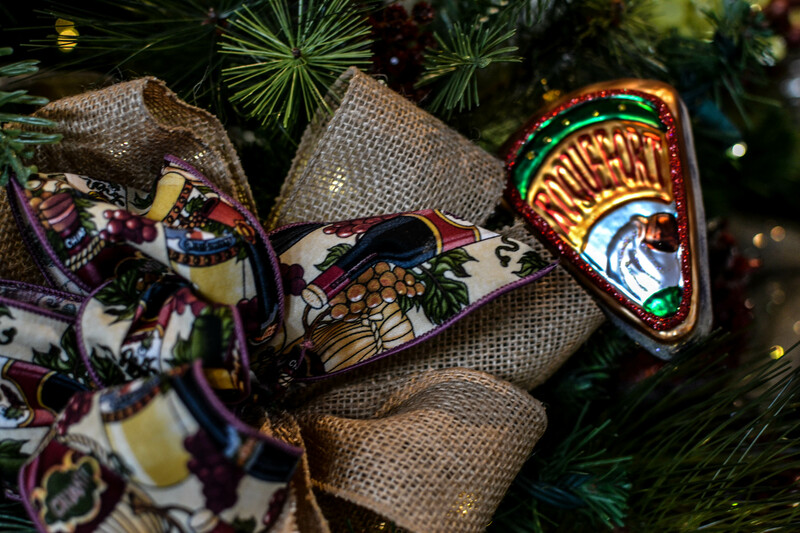 It honors the 16 million men and women who served overseas. 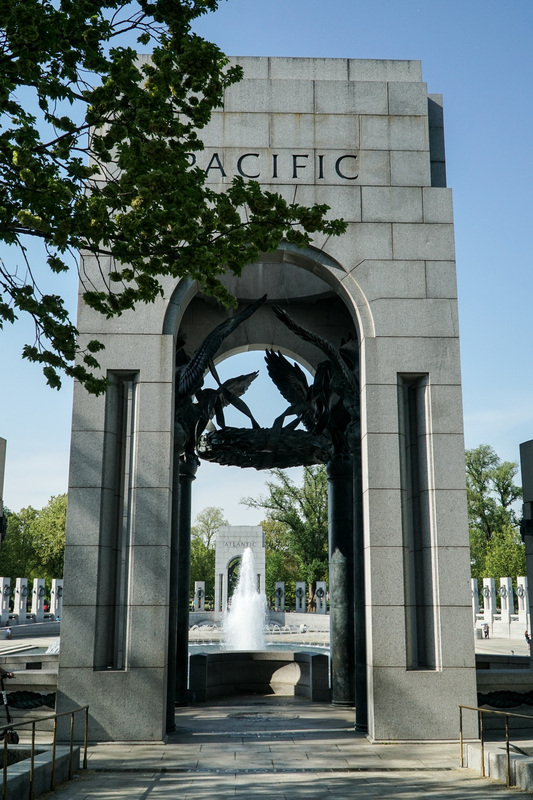 Granite columns curve around a fountain and represent each of the states and territories at the time of war. 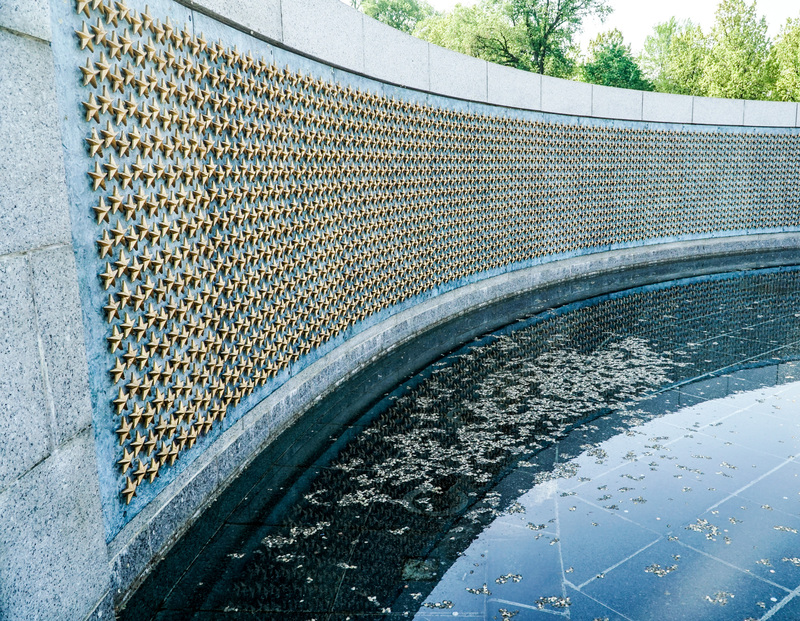 A wall of 4,048 stars, each standing for 100 people, represents the more than 400,000 Americans who paid the price to win the war. 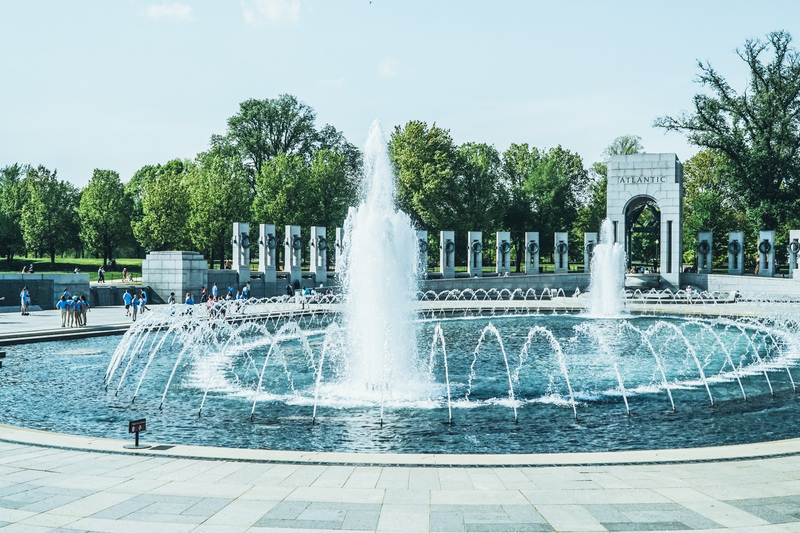 The memorial built to celebrate the heroes of the Greatest Generation remains one of the most visited sites on the National Mall, with more than 4.2 million visits in 2014. 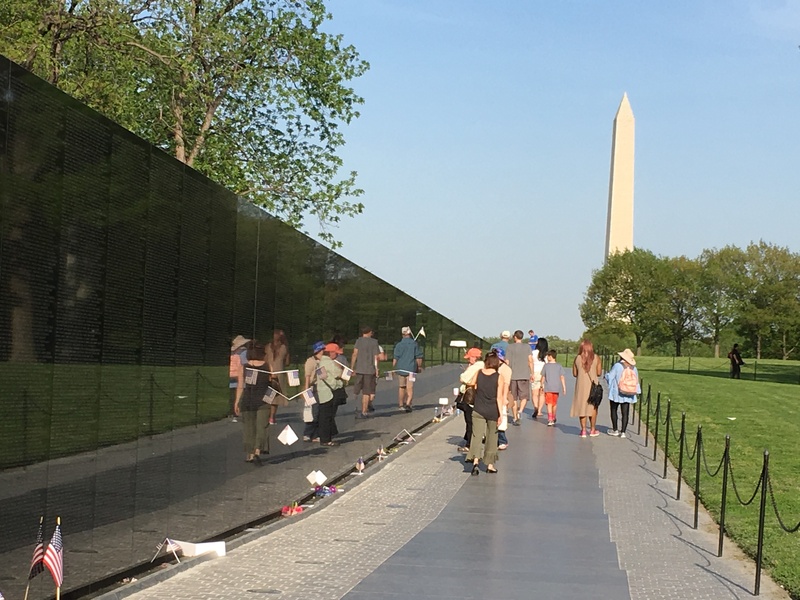 Down a tree-lined path from the Lincoln Memorial, walk a short way and you will find the Vietnam Veterans Memorial Wall. This is really two identical walls that are each 246 feet long. The black walls contain more than 58,000 names of those lost in this war. The names are listed in chronological order based on the date of casualty, with names for each day in alphabetical order. 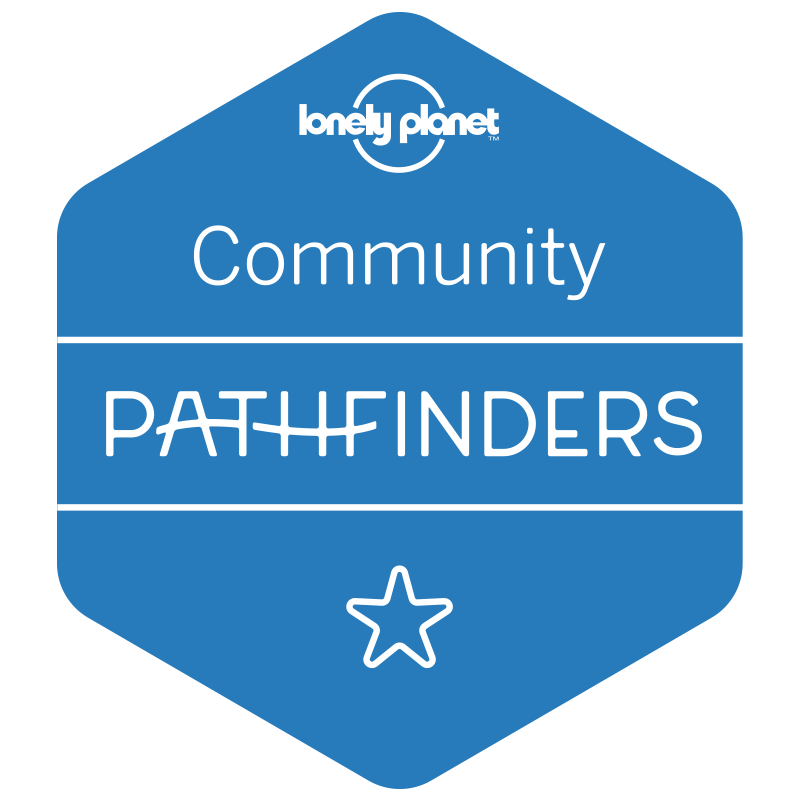 You can search online before you arrive to locate a name. Tributes of notes, flowers, and flags line the wall. These are cleared each night, so what you are seeing is the daily outpouring of honor. 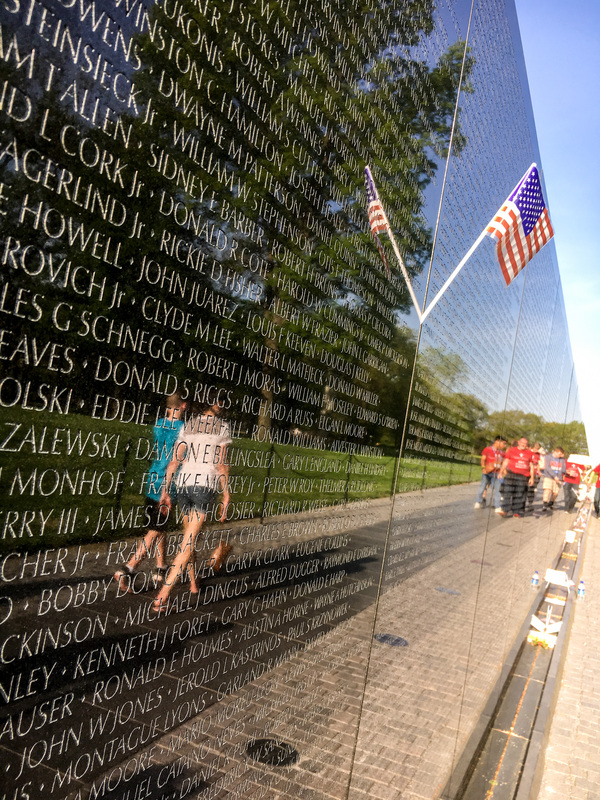 An unusual feature of this memorial is that visitors see their reflection in the wall imposed on the rows of names. The present and past are connected in this unique way. 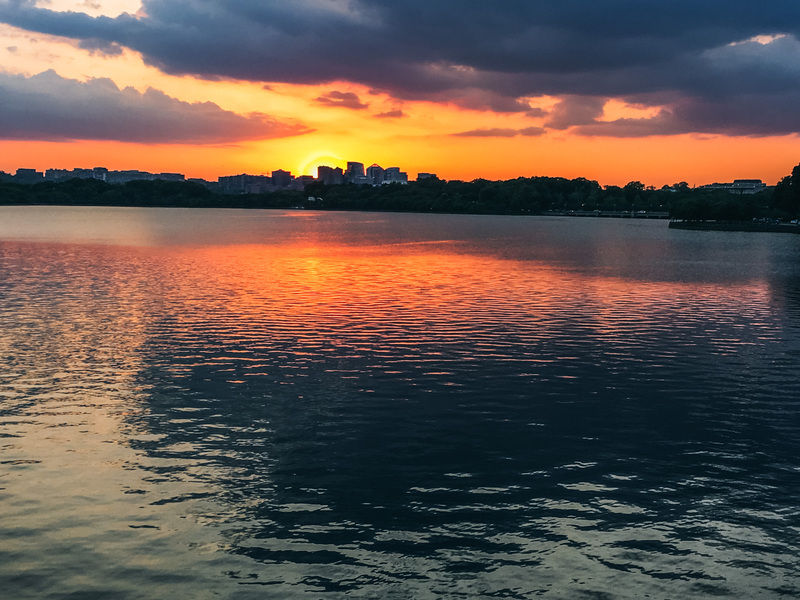 Make your way from the Mall west to the Tidal Basin, a man-made inlet off the Potomac River, and you will find three more memorials. 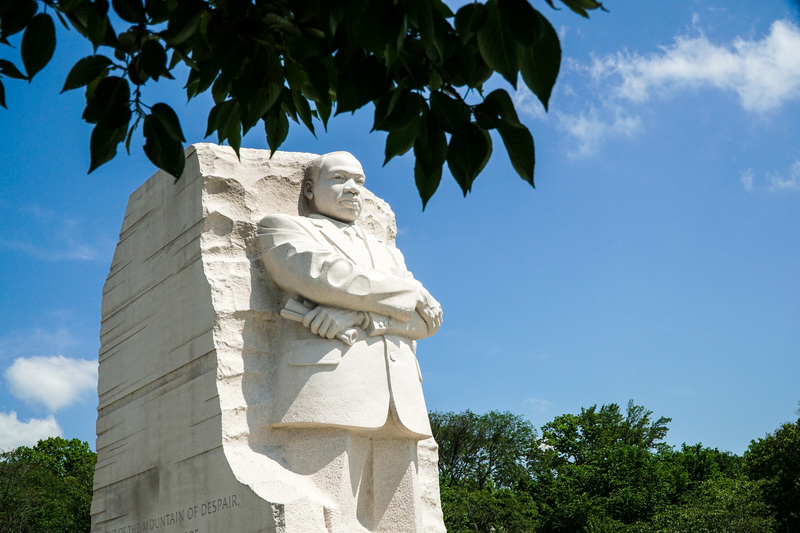 First, you will arrive at the Martin Luther King Memorial, the newest of the collection. 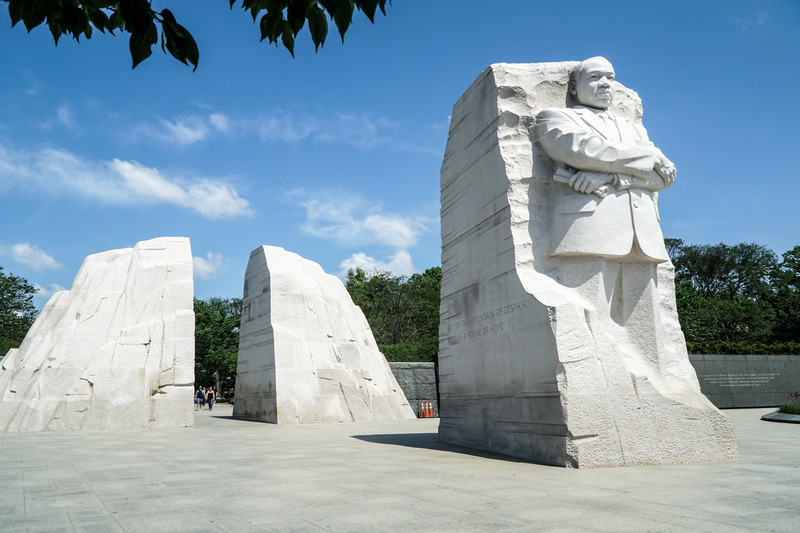 Opened in 2011, the memorial is based on a line from Dr. King’s “I Have a Dream Speech,” which was delivered from the steps of the nearby Lincoln Memorial in 1963: “With this faith, we will be able to hew out of a mountain of despair, a stone of hope.” Two large pieces of granite stand behind the chunk taken from them to carve a likeness of Dr. King. The wall behind the granite is etched with quotations from his sermons, writings, and speeches. 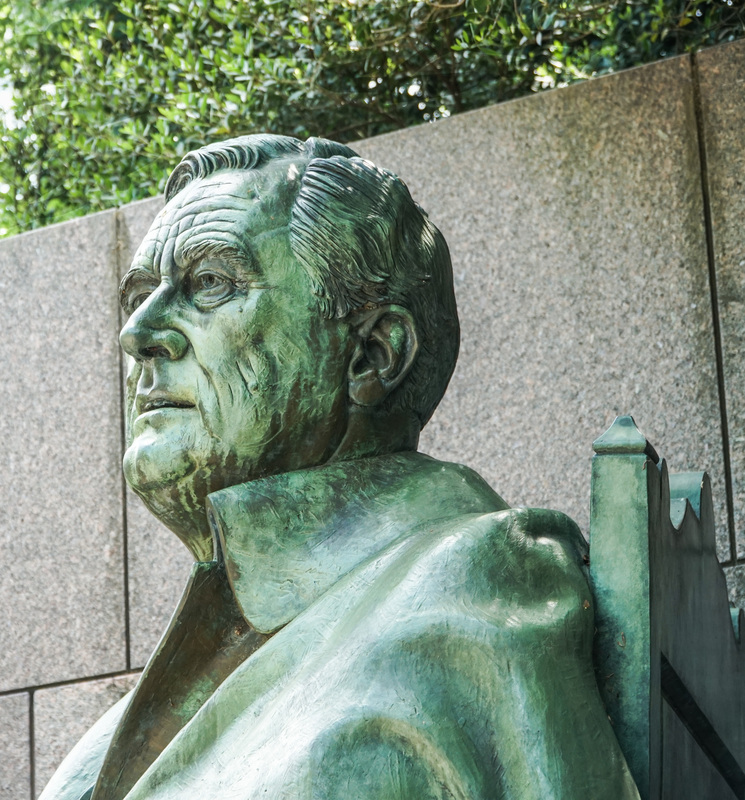 FDR is honored here as the longest-serving president of the US, as well as the leader who took the country through World War II. Outdoor rooms portray a scene from each of his four terms. 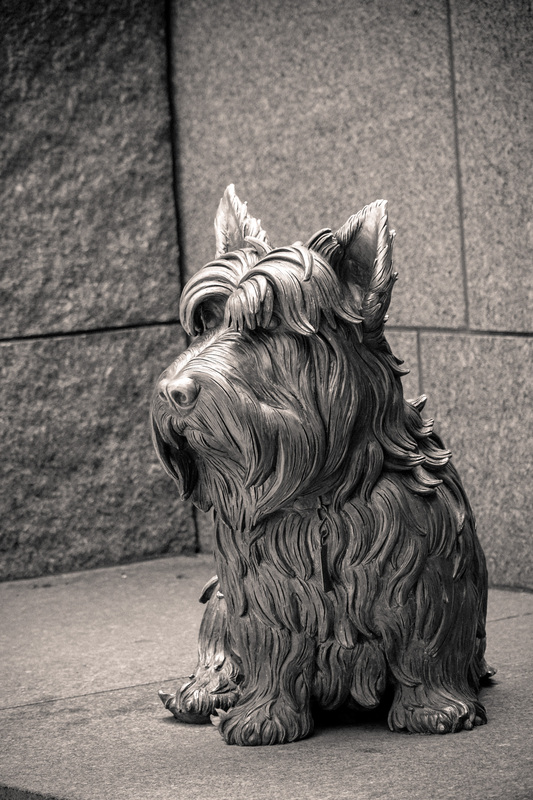 Here is the third term art, which includes a sculpture of First Dog Fala. 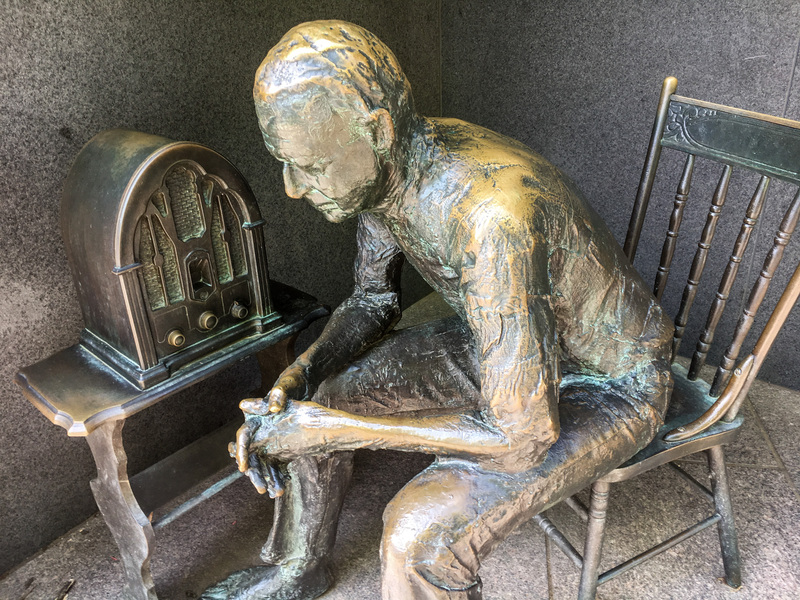 You’ll also see bronzes depicting the fireside radio chats and First Lady Eleanor Roosevelt. 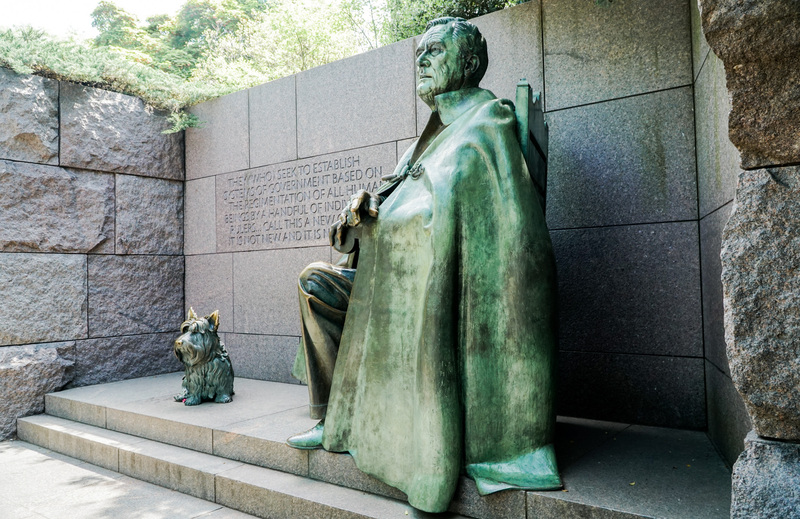 With famous FDR quotations and waterfalls, the many parts of the FDR Memorial make an impressive experience. 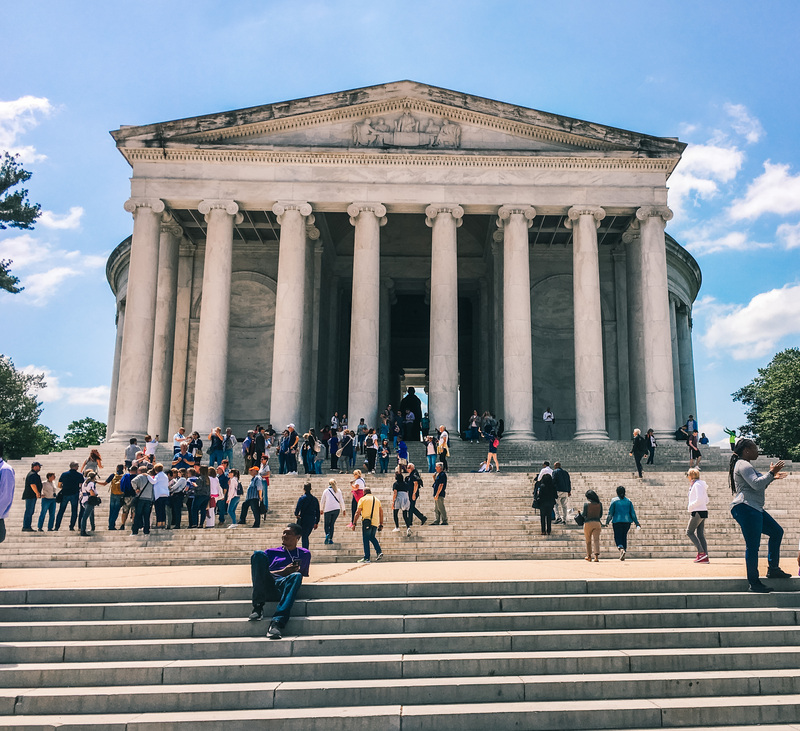 A favorite of many, the Jefferson Memorial is stunning in its neoclassical architecture. 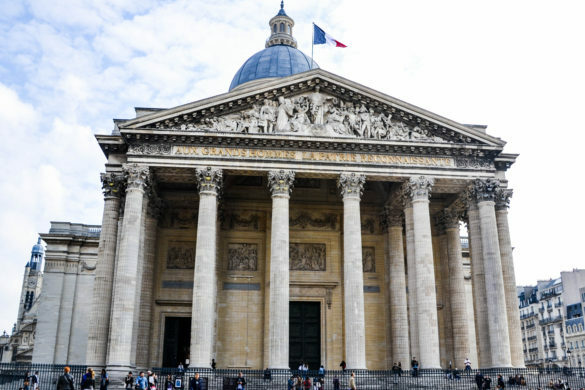 Designed as a smaller version of the Pantheon in Rome, it was built in the 1920s. Inside stands an imposing Jefferson, shimmering in the sunlight. 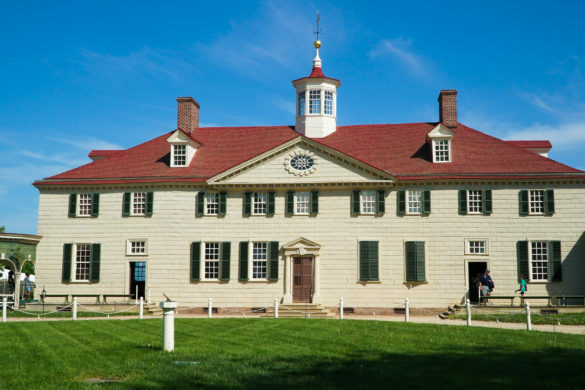 Inlaid in the walls are quotations from Jefferson, including his most famous document, the Declaration of Independence. 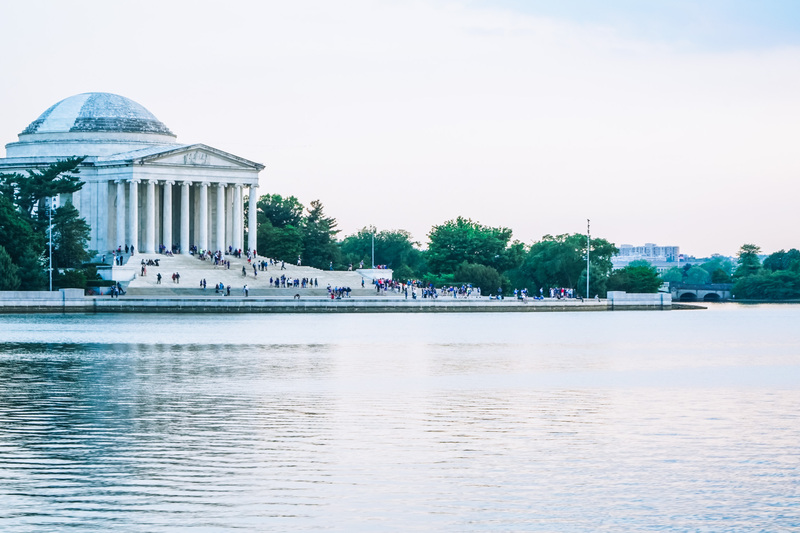 Stand on the steps of the Jefferson Memorial and look out across the Tidal Basin for a stunning view, especially at sunset. We missed only one of the major memorials. We reached this memorial in the dark as the skies opened with blinding rain. So I vaguely saw the shadowy figures, but I couldn’t get a photo. So I must return, right?! 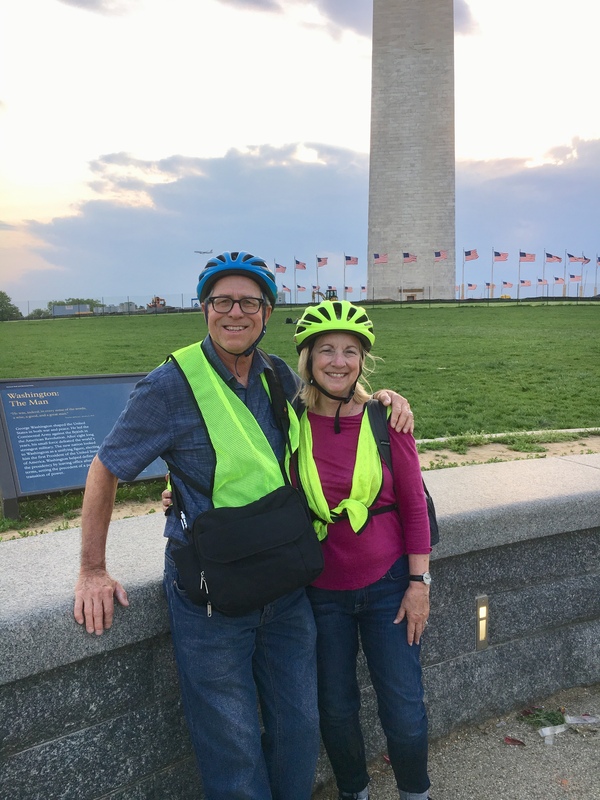 We enjoyed an evening bike tour of the memorials with Bike and Roll DC. Taking off at sunset, you pedal around the mall while an excellent guide fills you in on the history of each monument. A storm cut our tour short, but we would gladly book this again (even though they made us wear these dorky neon vests and helmets!). How about you? 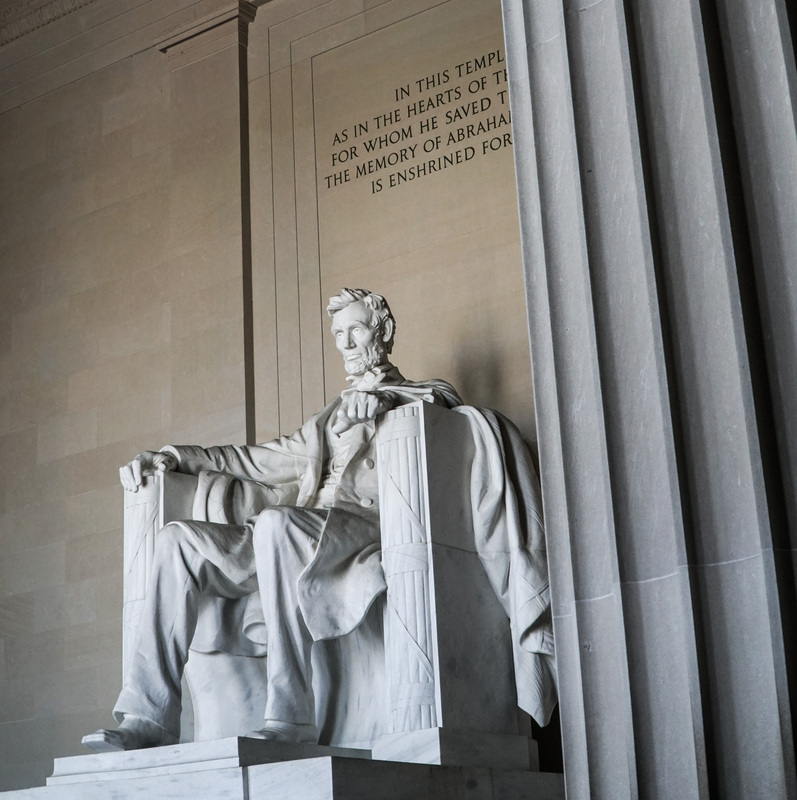 What memorials have you enjoyed visiting? The traveling exhibit of the Vietnam Veterans Memorial Wall came to our town twice in the past 14 years. Seeing all the names was overwhelming. Just sad. Lovely photos! Your writing is very detailed. I could imagine walking on the streets while looking at the structures. You’re making me miss DC so much! Gorgeous images. 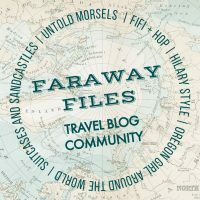 Great post with so mant gorgeous photos! A interesting Post. I love to read about the history of each Country ! Hello, lots of familiar scenes. Since, I live in nearby Maryland we have visited many of the memorials in DC. Somehow I missed the cute First Dog statue. Happy Monday, enjoy your day and week ahead! This brings back some wonderful memories of many past visits. 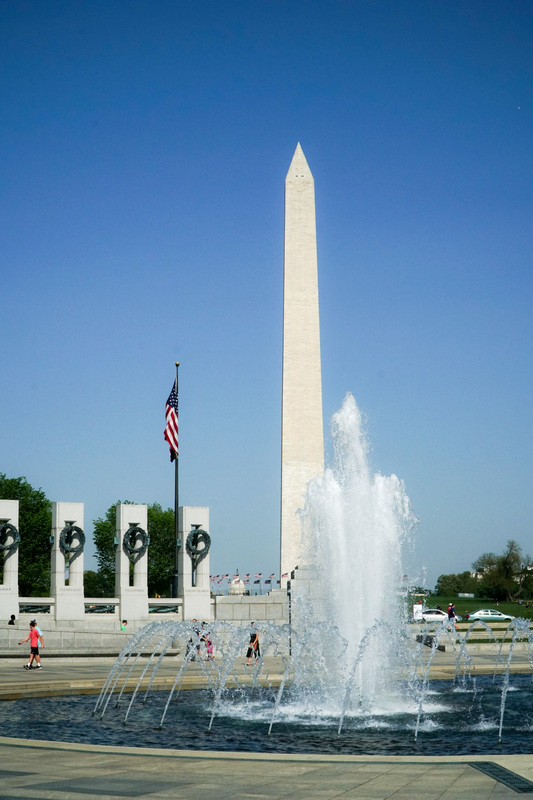 We however have not been there since the WWII and Korean War memorials were erected and would love to see those! Wonderful post! What a wonderful series of photos and great information! 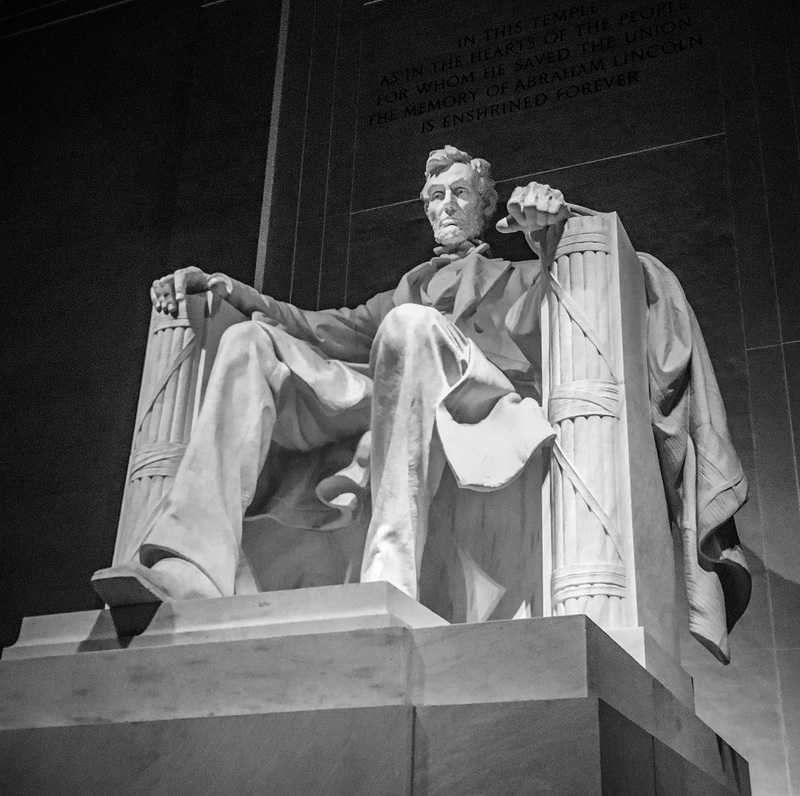 DC is one of my favorite places to visit – so much history, and the buildings are so majestic. 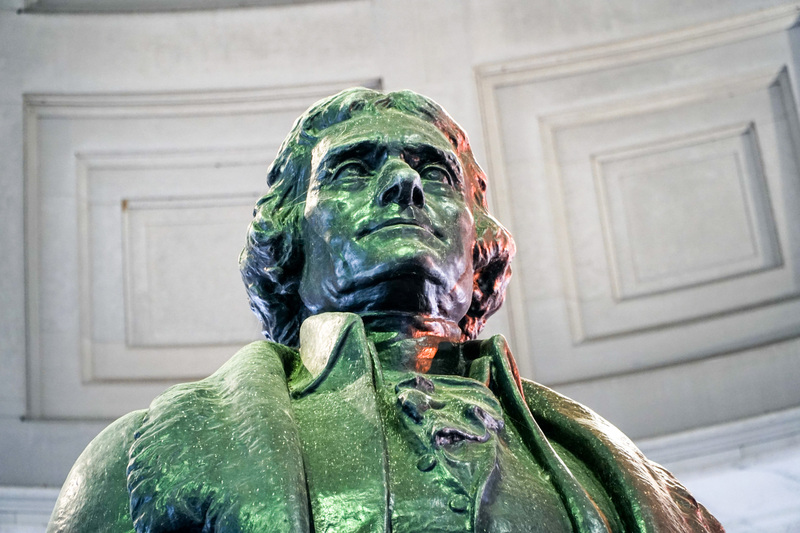 Nothing matches George Washington – such an iconic statue. But right after that the Lincoln memorial. And one of my neighbors just visited the Vietnam memorial – just seeing the names is touching! 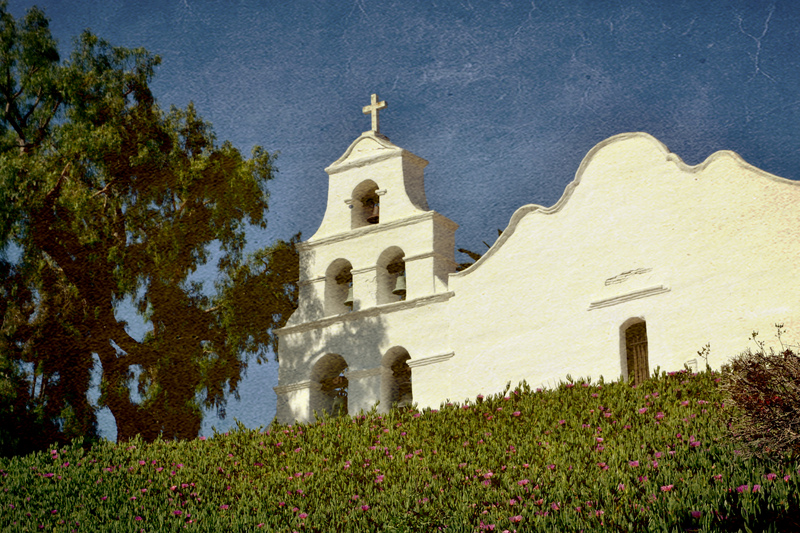 Many thanks for sharing these war monuments with All Seasons -highly appreciated, Sharon! 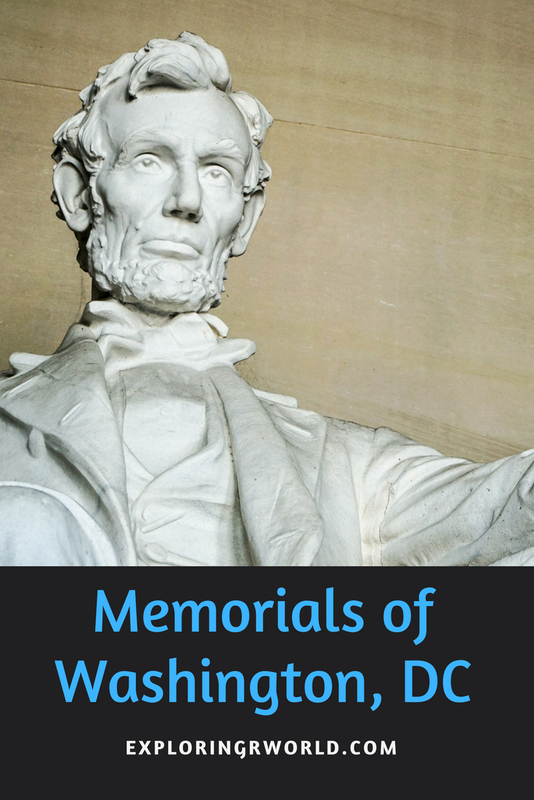 This is a great post, I had no idea that there were so many lovely memorials in DC! I love your photos. A post that tempts everyone to visit. I for one am very tempted. Must plan a visit. I loved touring the monuments in Washington, DC. My favorite was the World War II memorial. We spent the most time there by far. I’ve studied a lot about that time period so it was a good place to go to reflect and pay tribute. So much history there! 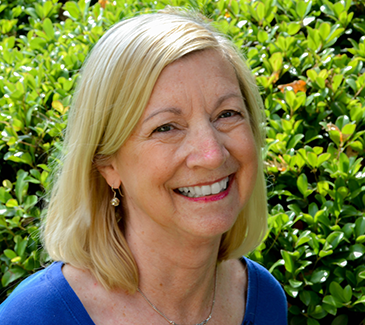 I love your photos, Sharon! An evening bike tour sounds like a great way to tour all these monuments. 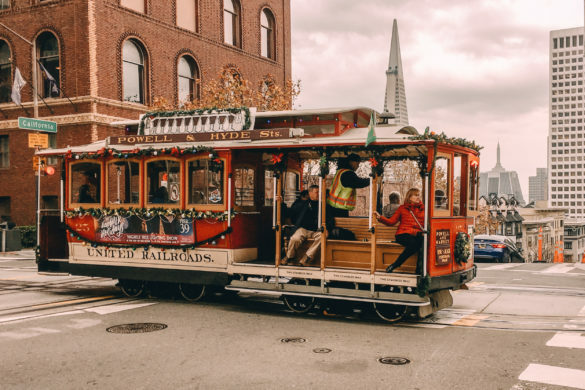 Thanks for the virtual tour – your pictures are fabulous! I love how the dog Fala got in on the action! 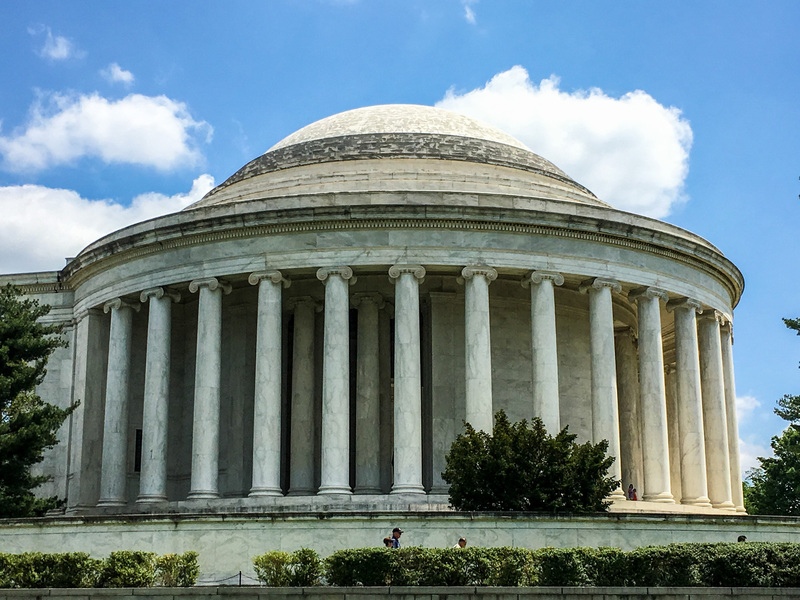 Washington is one of my favorite cities – and I think the memorials are so worth a visit! The last time that I was there was my first time to see the World War II memorial and the Korean War Memorial – which I think is so chilling, especially at night. We also took a nighttime tour which was quite cool – though ours was by bus not bike. Great photos, Sharon! 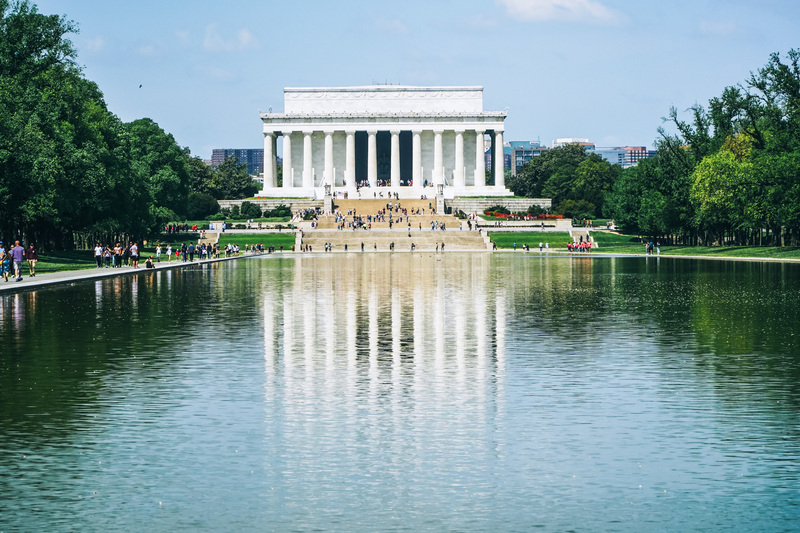 Washington DC is one of a few cities in the States that I was not able to visit yet! The memorials look fascinating indeed! Great Post! Pinned for the future! Great post! It makes me miss living in DC. I especially loved seeing these sights while the cherry blossoms were in bloom. I think my favorite memorial is the FDR. I love how it progresses over time and tells his story. I love D.C. and all the cool memorials! No matter how many times I’ve gone here, I still love to go see all these great spaces. 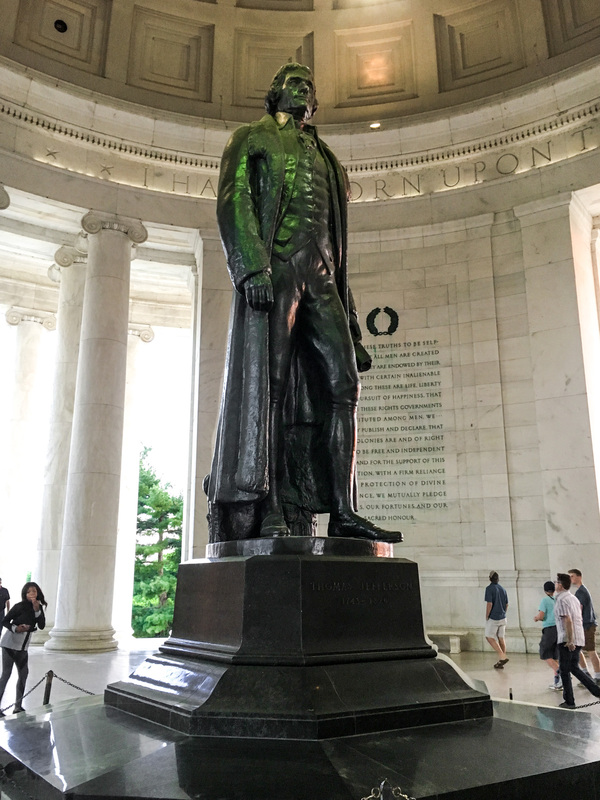 But, I have to admit, I haven’t been inside the Jefferson Memorial since I was little so I like seeing your pictures! 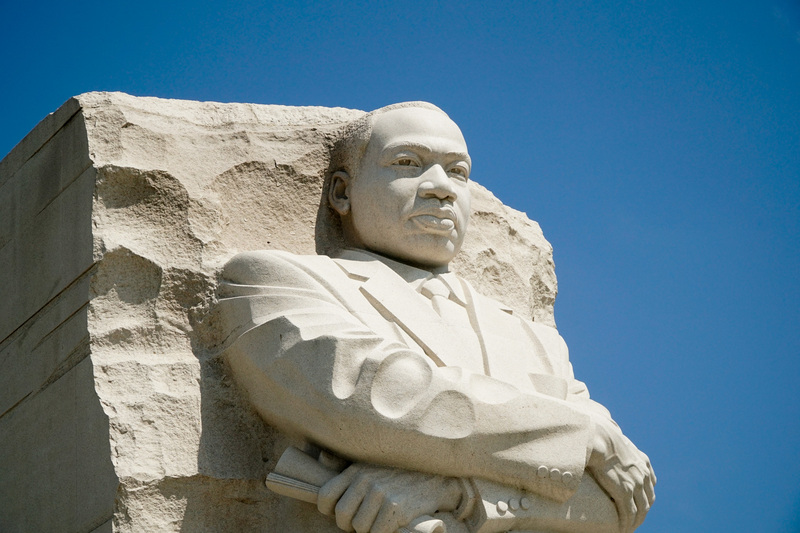 I have seen most of them, but I would love to see the Martin Luther King exhibit. You did an excellent job of capturing Washington D.C. 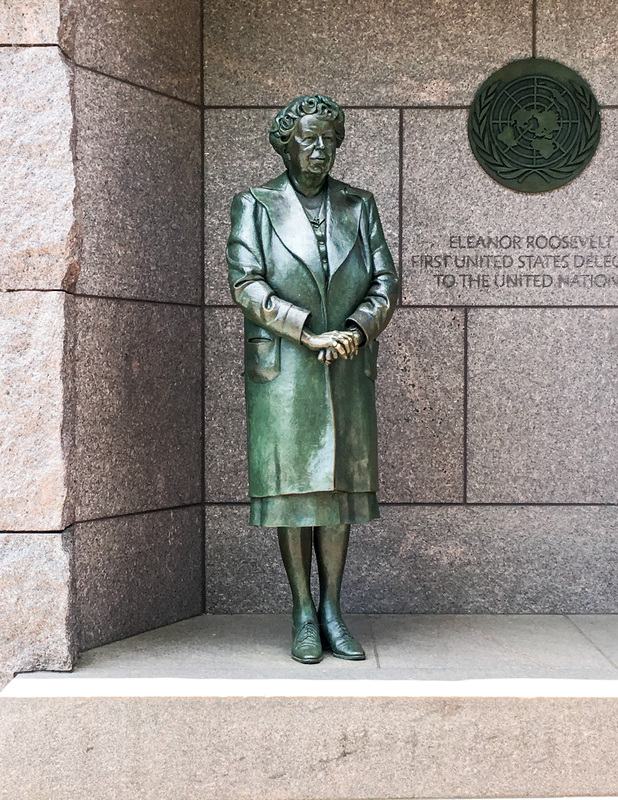 In addition to the landscape, water views, and monuments, I like the details in the bronze statues. 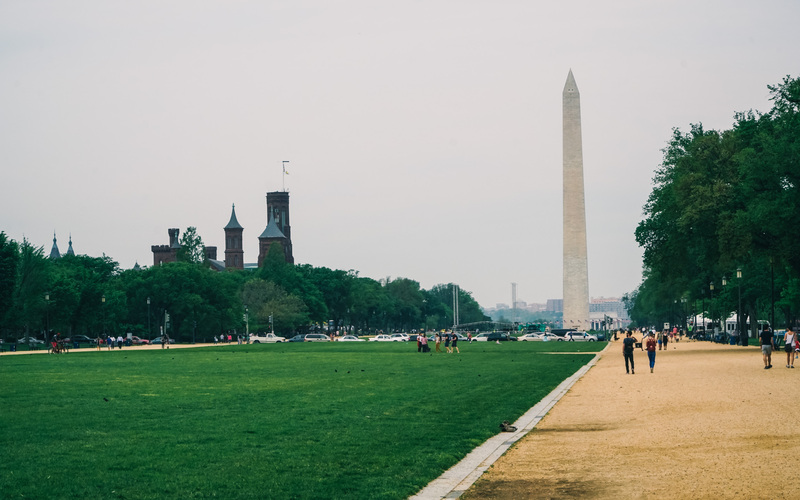 I love strolling the National Mall. I guess it should come as no surprise that so many of the structures are amongst the top rated in the US (I didn’t know that). 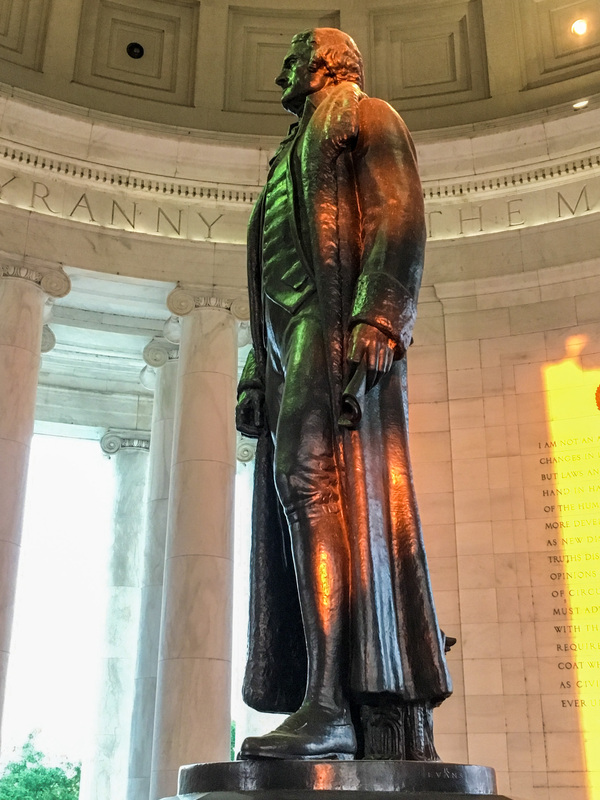 I love your colourful photo of the Thomas Jefferson Statue inside the memorial. 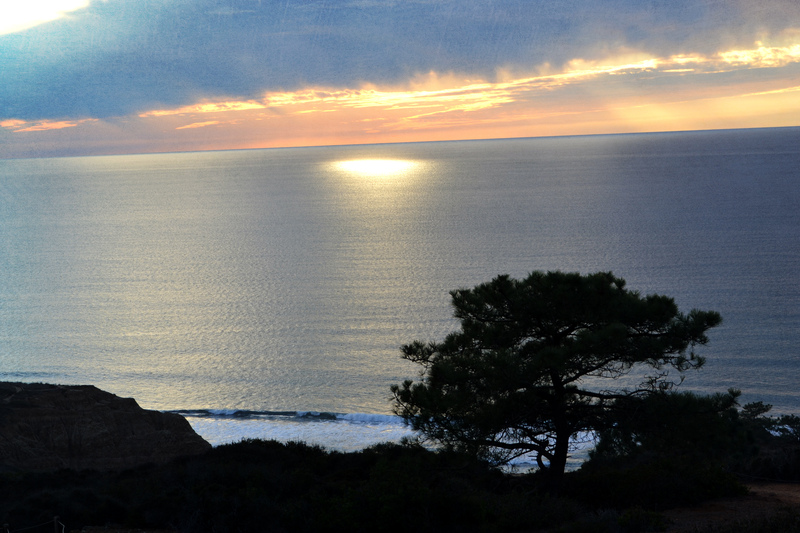 Absolutely gorgeous photo of that sunset! I can’t believe I haven’t been to DC yet. 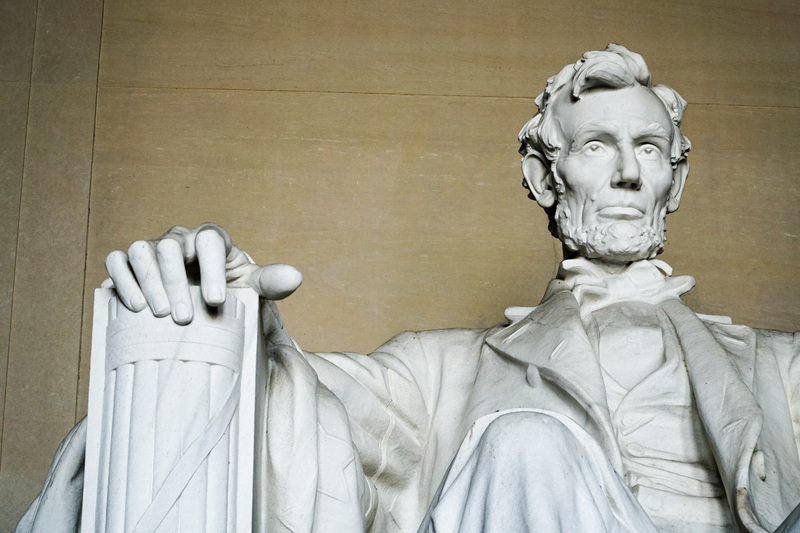 I haven’t been to Washington yet but when I do, I’ll definitely visit each one of these memorials. When would you recommend is the best time of the year to explore Washington? 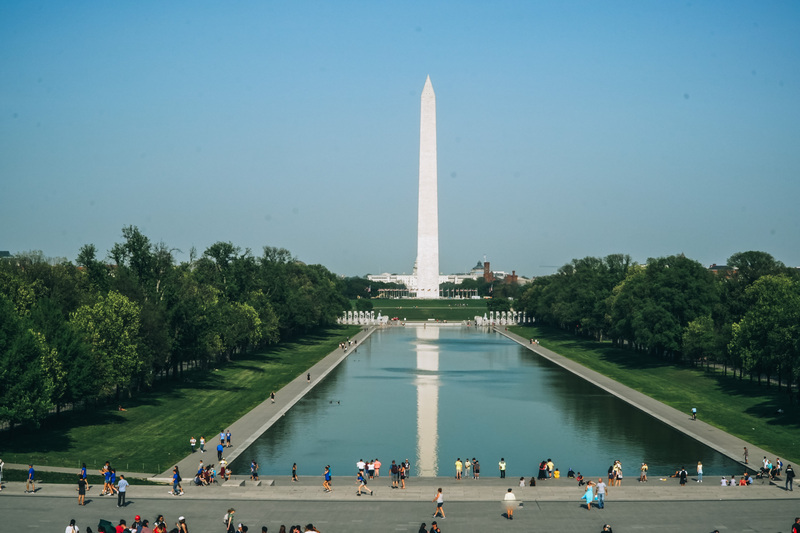 We loved visiting Washington and I would gladly go back to see it all again! We took a at tour from nyc so was a busy day and would love to spend more time seeing all the memorials! Sharon, we seem to have a mutual admiration for our nation’s capital! 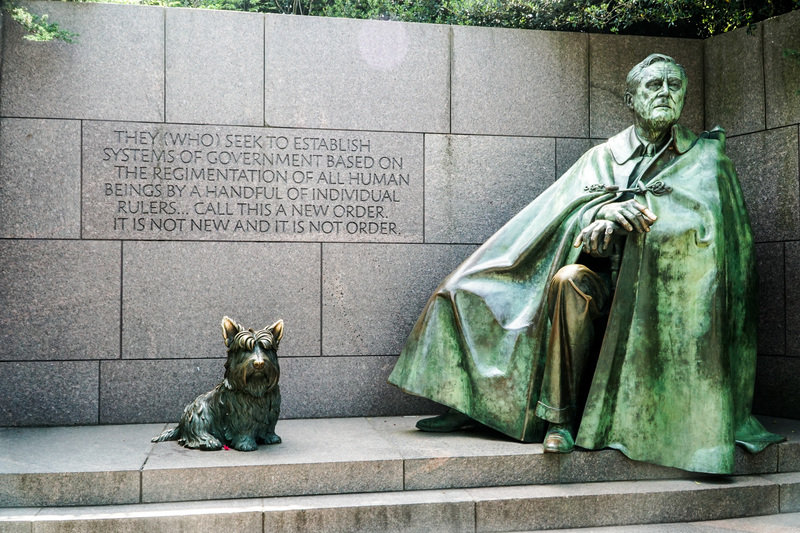 We love DC, but the two of us disagree over which monument “we” like best. Rob loves the World War Two Memorial, while Ann’s favorite is Jefferson. Of couse, he’s also her favorite historical character, so no surprise there. 😉 Great post – can’t wait to get to Washington again! 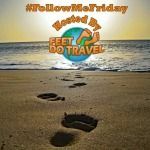 Thanks for sharing on #WeekendWanderlust & #TheWeeklyPostcard! 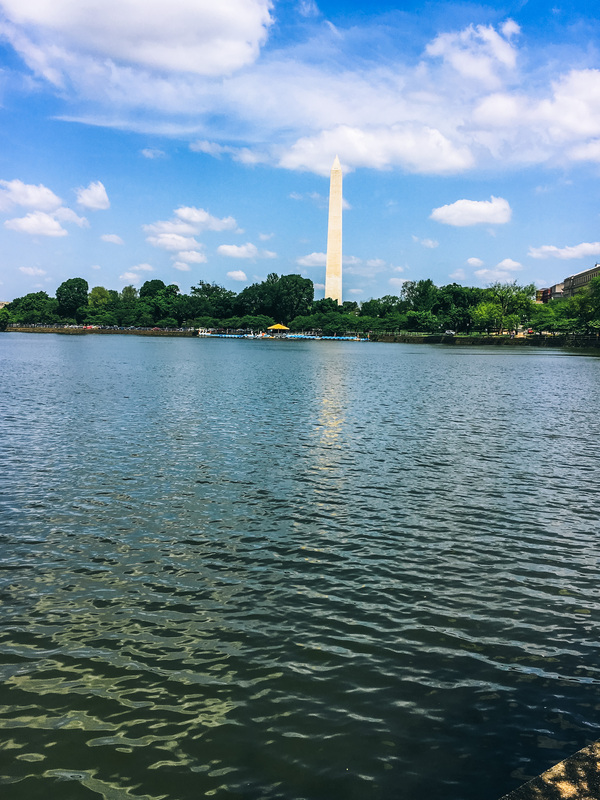 I really enjoyed DC – such a cool city and so much to see and do. The iconic monuments were definitely one of the highlights and I got to explore the area on bike which was awesome! Great post and photos!